New York Knicks center Amar’e Stoudemire is trying to move past his dumb, emotional self-inflicted wound. But as the Knicks are down 3-0 against the Miami Heat in the first round playoff series, many are still upset with his actions. Many believe it was a stupid move by Stoudemire to punch a fire-extinguisher after the Knick’s took a 104-94 loss in Game 2. Stoudemire punched a glass encasement of a fire extinguisher and suffered a laceration to his left hand. He was treated by paramedics after the game, received stitches and left the arena with his hand heavily bandaged and in a sling. 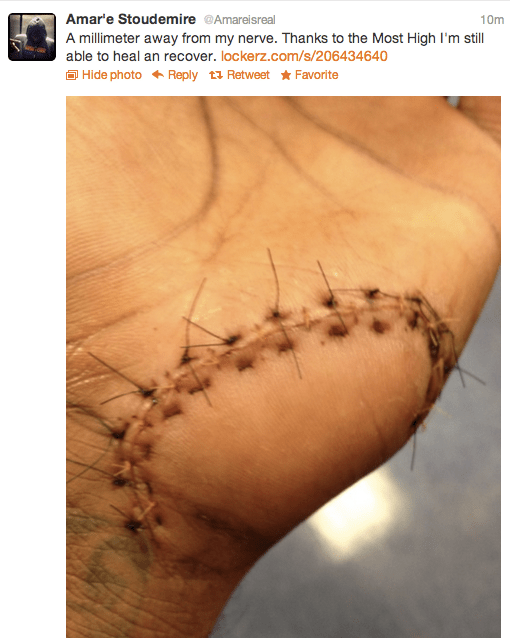 Now, Stoudemire is ready to show the world his injury. He posted a photo on Twitter of the wound. Stoudemire wants to play in Game 4. He was spotted on the practice court running, shooting, and dunking on Friday. We wonder will he be able to keep his emotions in check after the Heat sweep the Knicks on Sunday? Hmm.